HILLSBORO, WI – On August 13, 2018, the School District of Hillsboro’s Board of Education unanimously approved two referendum resolutions, which is the official action taken to place referendum questions on the November 6, 2018, General Election ballot. The first question that will appear on the ballot asks voters to authorize exceeding revenue limits by $500,000 per year for the next four years to maintain district facilities and current programs. This question is a renewal of a prior referendum approved by voters, which if approved again, would result in no tax increase over current level. The second question will be asking our community to invest up to $3,700,000 for district-wide facility improvements. This question will have an estimated $68 tax increase for each $100,000 of a home’s value for a period of 20 years. ● Acquisition of furnishings, fixtures and equipment. For over a year, the District has been assessing its facilities. In the fall of 2017, the District formed a Citizens Advisory Committee (CAC), comprised of parents, community members, and district staff, to review the facilities assessment and provide input on potential facility improvements. In March 2018, the District conducted a community-wide survey to gather the public’s feedback on potential improvement options explored by the CAC. 77% of all resident respondents stated “definitely yes” or “probably yes” when asked if they would support the renewal of the operational question. 65% of all resident respondents stated “definitely yes” or “probably yes” when asked if they would support a $3.7 million referendum. The referendum questions that will appear on the November 6th ballot are a result of this year-long facility study and community engagement process, and reflect the recommendation the CAC presented to the Board of Education. An informational flyer will be mailed to all district residents in September, outlining the questions and proposed solutions in more detail. In addition, two informational meetings will be held for interested parents and community members to learn more about the projects that will be completed should voters support the referendum questions. 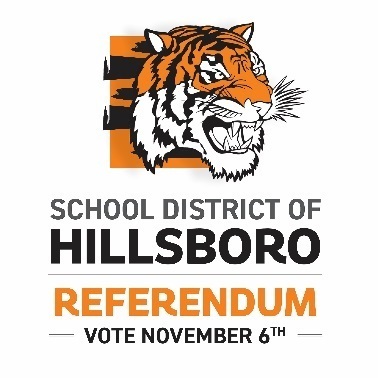 Questions can be emailed to referendum@hillsboroschools.org or directed to the District Office at 608.489.2221.